Access 2010 offers many options that let you design and run queries that return exactly the information you're looking for. For instance, what if you need to find how many of something exists within your database? Or what if you would like your query results to automatically be sorted a certain way? If you know how to use Access's query options, you can design almost any query you want. In this lesson, you'll learn how to modify and sort your queries within Query Design view. 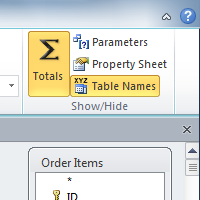 You'll also learn how to use the Totals function to create a query that can perform calculations with your data. You'll also learn about additional query-building options offered in Access.